Halloween is very near, with so many outfit choices available from simple cat & witch outfits to over the top, I'm looking at you Heidi Klum, who when she has her Halloween parties, she always has some fun & creative outfits. That isn't always in someone's budget or artistic realm but if you do decide to go out with the children, friends whatever to get in the Halloween spirit, Toni&Guy have some ideas in the form of hair accessories. Toni&Guy are helping with these hair accessories. Even though I don’t like spiders this Black Widow, hair grip I instantly fell in love with it, what’s creepier than a spider if you dislike them but this studded grip with white gems on the legs and black gems for the body and eyes make it a lot more pleasing to have a spider on the person. -_______I started off by washing my hair as usual. – cleanse, conditioner, mask. -_______Sectioning into 4 parts, I moisturised my hair while damp with black seed oil. -_______Using the BaByLiss Big Hair styler, I began to dry and style my hair. -_______Running the Toni & Guy Casual Radiating Tropical Elixir when finished to give extra shine to the hair. -_______Last touches spritz over the styled hair with Toni & Guy Illuminating Hair Perfume. -_______Pop the hair slide in where preferred. I think these appeal to the Rock Goddess in me. I live for black clothing & as someone once said I remind them of a mix of Kate Moss x Daria, so I'm a bit of heroin rock chic & grunge. I had one similar from another brand in gold but this one is certainly larger and giving more of a statement with the silver, gold spikes and multiple chains. The spiked hairband, very different - I haven't come across one like this before. 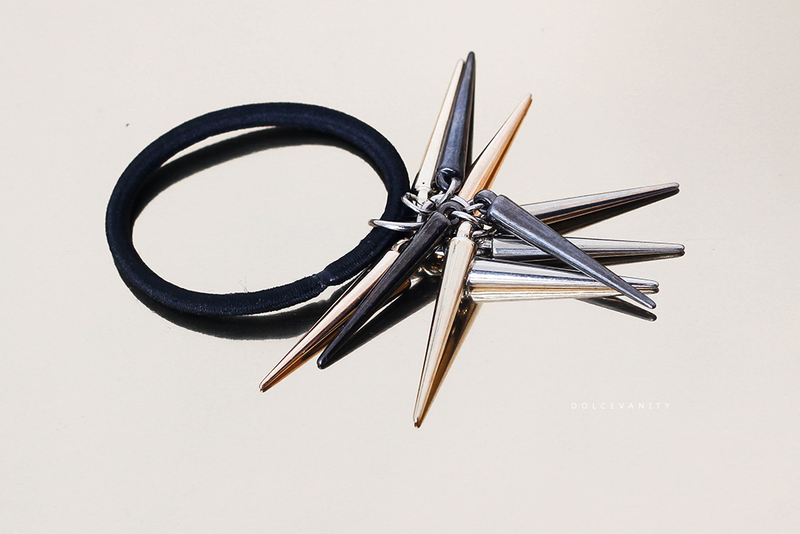 It has a mixture of gunmetal, silver and gold spikes that just hang and give a gentle sound to their movement. Onto the nitty gritty. Being that I love horror films, this time of year it's like my holiday. Being able to indulge more in the scary films and loving all the S/FX. I just really enjoy Halloween. Sue me! 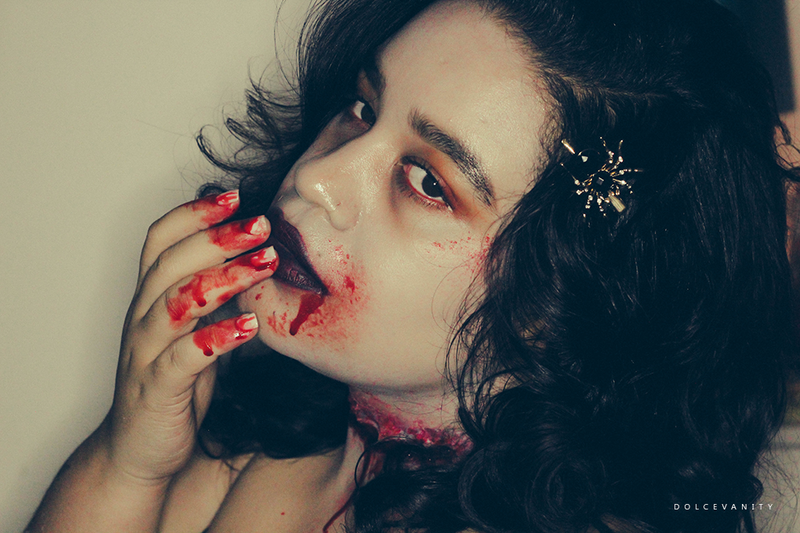 -_______Ben Nye Death Flesh as a base and I used blues and white from the MakeUp Forever Flash Palette's. -_______For the eyes a lot of reds & oranges from the Morphe 350M palettes. -_______Using a taupe to highlight and sink in the eye socket. -_______Sleek Makeup Eau La La Liner in Rouge for the waterline. -_______LA Splash Lip Couture in Malevolent & Vampire mixed. -_______For the neck, I created a silicone mould and freehanded the cut with the silicone - leave to dry. 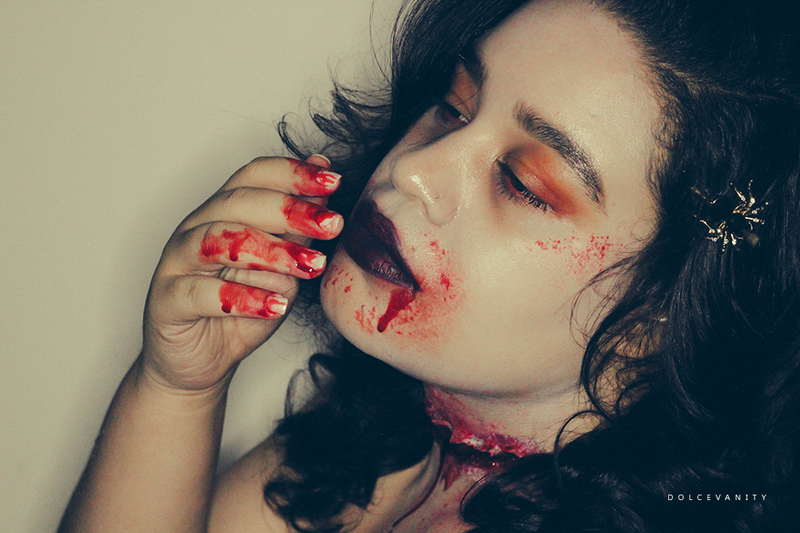 -_______Add yellows, greens, purples and reds for some rotting flesh. -_______Inside coloured it red and black and stuck clotted blood and runny bloods inside. Finish by splattering blood all over. I love that spider! I'm not the hugest Halloween fan and rarely go all out, but even I could rock that cute piece! She's beautiful! That's exactly it, something for everyone. Even if it's just to slide in a hair piece to get involved. Oh Wow I love the hair accessories - the spider is awesome! Very gorgeous. I love it myself and I dislike spiders lol. 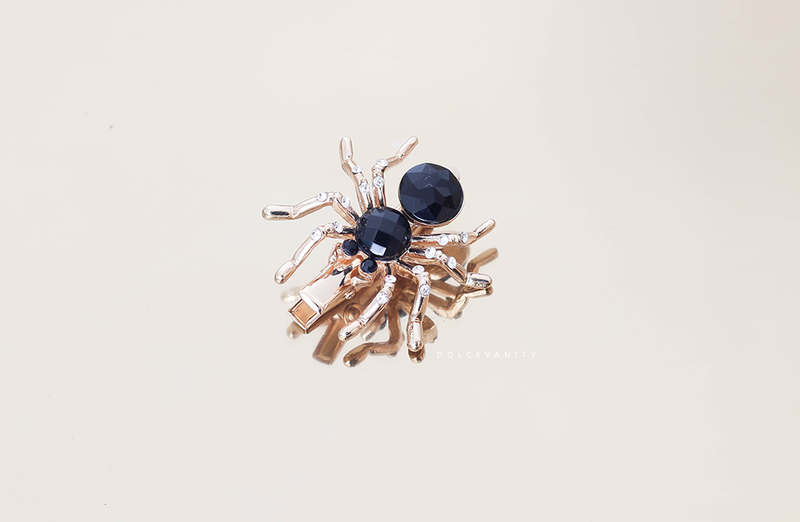 I did not know that Toni and Guy did Halloween accessories but I am loving the spider. Your makeup is fierce as well. I don't know if they have previously but this year - definitely are. Thank you Ana. oh wow what a fab look, loving that spider, its super cute! Isn't she Deborah, very fierce. Thank you. Your hair looks fab dressed up like this - I didn't even realise T&G sold hair accessories! Thank you Samantha, oh yeah so many different hair accessories. That's a very good picture. I like those jewels, particularly the spider, although I think the other ones would work better for everyday as far as I'm concerned. Thanks Mika, those are suitable for daily looks, I think really they all could be. I love the hair accessories, I need those so much! Those hair accessories are fab! My days of going out for halloween are long gone now! Aw! I never go out for Halloween - only twice when I was younger lol. What amazing looking accessories i didn't even know Toni and guy did hair accessories. Seems quite a lot of people didn't but yeah they do, some real interesting ones too. I think the Black Widow is so pretty! I love the other accessories too and you did an amazing job on your makeup. Thank you Liz, Black Widow is gorgeous. I really love the design. That make-up is SO good! I wish I was going to a Halloween party this year! I am loving the hair accessories. They are so pretty. They are, I think they'll be good all year round. Oh wow those hair pieces are so cool!! I love the spider! The spider is a beauty. The images are just incredible and I love that spider, it is just beautiful. Thank you kindly. I know - it's proved to be such a hit, I loved it from the images alone. 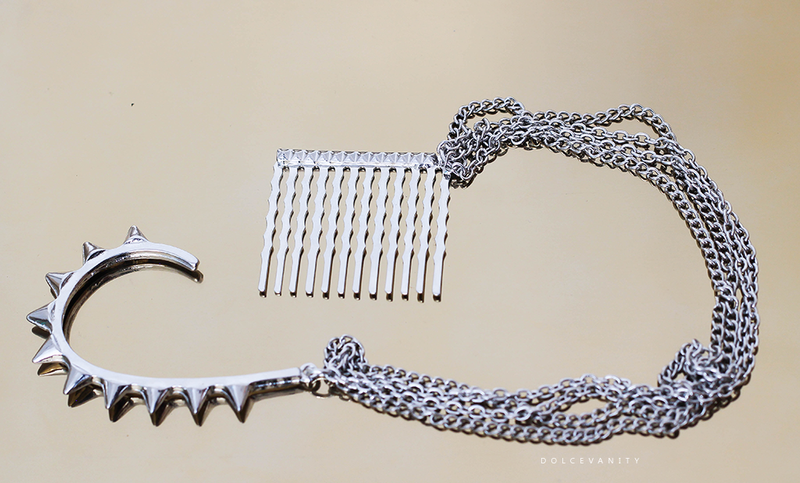 The pretty in punk hair accessory is insane. I love it! I love hair accessories like that too. this looks so good! love the volume in your hair! Thank you so much. Got to love the BaByliss big hair. I don't really think about hair accessories that much when it comes to hallloween costumes but this has really intrigued me to find out what really is available! Yeah I haven't myself much, maybe a headdress etc but it's a good direction to go. Wow I didn't realise Toni and guy did Halloween accessories. I shall have to look out for those. Yes, they've got different bits and bobs on their website. More than I knew. OMG!! I got spooked there for a minute that's because I was forgetting that Halloween is just around the corner lol... But great makeup it looked so real. Haha thank you so much Leslie. I feel my job was done lol. This is such a great look for Halloween! Thank you Jemma. I did try. Thank you Lilinha, they are. I love that spider! It's so cute and stylish! Right!? It really is, I adore the spider. I love the spider! You photos are amazing and I love the make up. Aw thank you so much. Spider is beautiful. The make-up looks awesome, and I never knew they did hair accessories, my favourite is the spider. Thank you. Mine too it's amazing, they do such a huge range of accessories. I love the hair accessories! This is definitely something I would wear! Love your makeup! I always fail big time at halloween makeup!